A kitchen is many things. It’s a meeting place, it’s the most functional room in a home, for many it’s the heart of it too. But, above all, it’s a space that needs to be practical to use with everything in its place. So, alongside all of the aesthetic and design considerations that go into all of our kitchens, we also ensure an elegant solution that means everything is perfectly organised and which makes working in it a pleasure. It’s a skill that we’ve perfected over many years and across many projects of every size – and it’s one that we’d like to introduce to you too. 54EA are proud stockists of Siemens appliances – in a world where functionality is key, Siemens promises functionality is never boring! Creating appliances where outstanding is the standard; Siemens deliver uncompromising design and innovative technology. Intelligently designed appliances make life even easier – with time saving solutions such as ovens featuring variospeed that increase cooking time by 50%, without compromising on taste and flavour. The first dishwashers to feature zeolith dry technology – delivering sparkling dishes every time! Energy efficient appliances including refrigeration with hyperfresh food preservation and freezers that never require defrosting. Each appliance is stunningly designed to seamlessly co-ordinate with the rest of your living space; Siemens appliances offer the perfect balance between modern design and innovative technology. To make life even easier use Home Connect to take control of your Wi-Fi enabled Siemens home. Cooking	Whether your creating an intimate dinner for two or preparing a banquet for twenty, 54EA selection of the finest modern Cooking Appliances gives you the future of cooking. Sinks & Taps	Kitchen essentials are anything but boring at 54EA. Our selection of sinks and taps are designed to perfectly compliment your beautiful kitchen. Worktops & Surfaces	The perfect worktop really does bring your kitchen together. Once you've designed your dream kitchen, we have the ultimate range of worktops to suit you - from hardworking granite to the rustic charm of solid wood. Refrigeration	Our expertly designed fridge freezers will leave you spoilt for choice. Weather you're looking for functional or fancy, some of our models feature ice makers, water dispensers or even automatic defrost. Accessories	The right appliances and accessories can always help to make your kitchen feel like home. 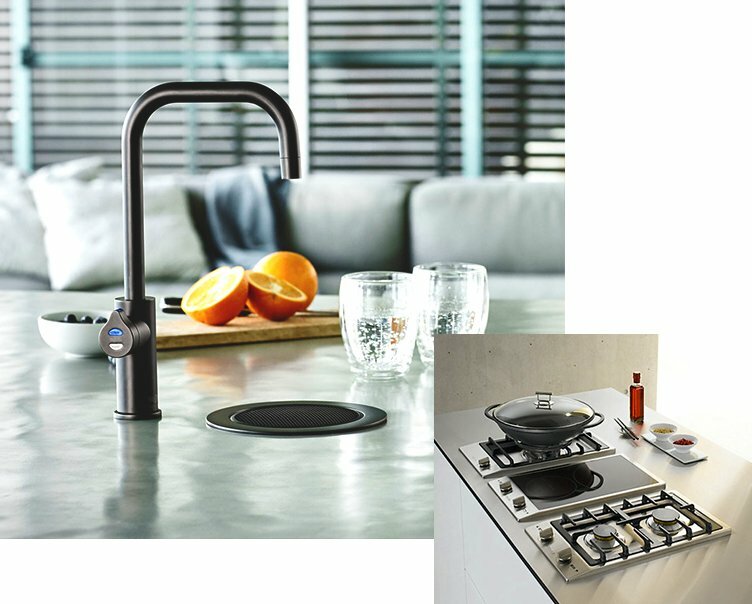 We have the perfect integrated appliances help make your life that little easier, from high tech coffee machines to expertly made chopping boards. Fitted Fireplaces	Designing your own kitchen means you can have it just the way you want. So, why not create a relaxed and inviting atmosphere with an integrated fireplace.